You wake to the familiar wail of your alarm clock. A few months ago, you would’ve thrown back the covers and bounded out of bed in anticipation of the workday ahead. Today, you flail for the “snooze” button. You just don’t feel like going in. The planner job you took six months ago seemed like the best idea in the world great company, great people, lots of travel and excitement. But downsizing has left you understaffed, mergers have left you out of the loop, and a heavier-than-average workload has left you completely exhausted. You are blazing down the road to burnout, a condition that comes after an extended period of on-the-job frustration due to any number of stress factors. Whatever the cause, in an industry like meeting planning, where the only constant is change, burnout happens. Maslach is the creator of the Maslach Burnout Inventory, a widely used research measure to discern how employees experience their work. Her recent book, The Truth About Burnout: How Organizations Cause Personal Stress and What to Do About It, co-authored with Michael P. Leiter, explores how companies create stressful work environments for employees and what steps victims can take to remedy their situations. Hitting the snooze button may be normal for you, but there are other telltale signs that the flame on your candle is flickering dangerously. For some, the first sign is physical. If co-workers continually ask you if you’re feeling well when you’re not sick, take a long, hard look in the mirror. Physical signs can include skin breakouts, dark circles and hair loss. Normally active people may start skipping exercise routines, says Maslach. Consistent exhaustion regardless of how much sleep you’ve gotten is something to watch for, especially in the morning when you’re gearing up for a day at work. Tasks once perceived as challenges become problems that are avoided for as long as possible. It’s common to just stop caring. “It will become a rare occurrence,” says Maslach, “to feel you’ve accomplished something of lasting value.” Since counterproductive forces in the work environment are often at the root of the problem, it becomes increasingly difficult to push past the bureaucracy and complete an assignment to the best of one’s ability. Planners who were once eager to embrace new company policies may become increasingly sarcastic. “Those on the verge of burnout will feel almost compelled to make cynical responses to nearly everything that occurs within the organization,” says Maslach. And since they are continually less concerned with their jobs, they stop caring who hears their disparaging comments. While Maslach notes sometimes those suffering from burnout are poorly suited to their jobs, “Switching careers should not be your first option…Often, you have to look at what’s wrong in the organization,” she says. 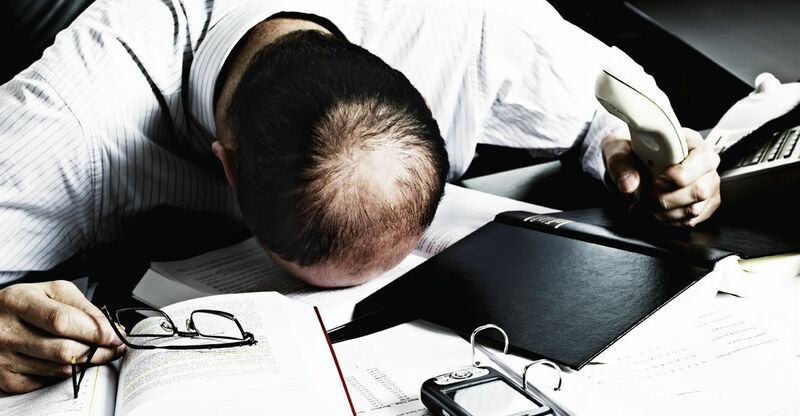 The Truth About Burnout outlines six areas of organizational life within the structure of a company where conditions may be unsatisfactory perfect breeding grounds for burnout. Let’s face it, even the happiest meeting planner tends to put in ridiculous hours, but take a good look at yours. Has the fact that you work hard only made management heap more onto your plate? Are you able to return all of your phone calls within a reasonable amount of time? No matter how many lunches and sunsets you miss by staying at the office, do you ever feel like you’re accomplishing everything you need to? When you suggest a new policy or procedure within your department, does upper management allow you to implement it? Without a sense that you are responsible and are empowered to make decisions, you’re bound to feel like you’ve got no control over the outcome of your efforts. People work best when they feel well-compensated and appreciated, points out Maslach. And compensation doesn’t always mean money. Does your boss give you a pat on the back when an event is a banner success? Are letters from satisfied clients forwarded to you from upper management with a memo of congratulations? The simplest kind words can often motivate people to strive for even higher goals (something to remember when members of your staff do exemplary work) and make them feel like the work they’re doing is worth the effort and stress. In self-directed team environments, there is often a lack of specific methods for handling disagreements. Conflicts between colleagues can cause an extremely uncomfortable climate in the office. In an atmosphere where employees sense it’s better to keep their mouths shut rather than express ideas about how work can be improved, there’s real potential for burnout. When companies place emphasis on short-term financial success rather than building an organizational community, they are fostering an environment that lacks trust, openness and respect. Pressure and competition in the marketplace can lead to secrecy. When a company fails to disclose important information to its employees, it makes planning very difficult. In essence, it’s simply unfair to expect planners to be able to work when they’re not even sure in what direction their company is moving. Do you see eye-to-eye with higher-ups? If the company is consistently looking at the bottom line, while customer satisfaction is your main concern, perhaps the problem lies in a conflict of values. If management is telling you to act in a manner that goes against your personal beliefs about how your job should be performed, you’re swimming upstream. If your company is burning out its employees, there are alternatives to handing in your resignation. Identify key problems, and make an effort, either independently or within your department, to enact change. A group of determined individuals can work together to eliminate the factors that make work counterproductive and mentally exhausting. As Maslach and Leiter write in their book, “Whatever the solutions proposed to deal with the burnout, they cannot be implemented in a vacuum.” Although these steps can be initiated by a single person or a group, they have to take place within the organizational structure of the company. “Ritualization is the real key to preventing burnout,” says Luban, who recorded the tape series, Keeping the Fire: From Burnout to Balance. Daily rituals can be as simple as making a cup of tea, putting your feet up and reading the paper before taking your morning shower. A 10-minute break every two hours in the office can have the same rejuvenating effect. Luban suggests leaving stickers in strategic locations to remind yourself on your wallet, computer screen, rear-view mirror. As Susan’s responsibilities grew, so did her stress level. Then, when the company downsized last year, two planners were fired and she and an assistant were left running the department. Despite her hard work and extremely long hours, Susan rarely received any acknowledgment from her superiors. “It wasn’t a very friendly company,” she recalls. Laura started working in a West Coast office of a financial company two years ago, just after a merger that joined a big and aggressive Midwestern firm with a small, family-run operation in California. Laura soon recognized the politics involved were beyond her control. “There was a lot of cultural miasma,” she says. The problems ran deep within the organization, says Laura. “They had this hypocritical creed that was wonderful in writing, something about the courage to be different.” She and her colleagues often joked that the company urged them to be different in order to single out the troublemakers. Not long ago, Laura and her team were let go when the company decided to consolidate and close the West Coast office. “I think it was a source of embarrassment for them, because my department won a major industry award just after we were let go,” says Laura. Some all-too-common management failings can set the stage for employee burnout. Do these sound familiar? Your boss doesn’t allow staff time to replenish their creative energy. He/she acts as though time were money, rather than something much more valuable. He/she ignores or gives only trite recognition to what staff members contribute. He/she encourages conflict and destructive competition. He/she makes decisions you feel are unfair. He/she forgets organizations are about people. He/she doesn’t listen to people.